This light house of Alexandria was one of the wonders among all the seven wonders of the world, which was constructed to serve a practical purpose. Besides being a marvelous example of architectural elegance, it ensured a safe return for the sailors to the Great Harbor. The mirror that was mounted at the top of the lighthouse could reflect light more than 35 miles off-shore. The scientists were fascinated by this mysterious mirror. The Lighthouse of Alexandria was conceived in the early 3rd century BC by the ruler Ptolemy I, an ex-general of Alexander the Great, the conqueror who founded and gave his name to Alexandria. 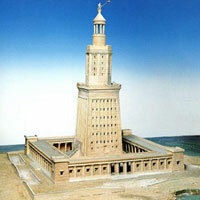 Ptolemy II (the son of Ptolemy I) finished constructing the Lighthouse of Alexandria about 25 years later. This lighthouse was built around 280 BC and was around 134 m in height. This was built in the city of Alexandria. Alexander the Great had seventeen cities named after him. Most of them are no longer in existence except for Alexandria, Egypt. The city needed a mechanism to guide the trade ships into its harbor. 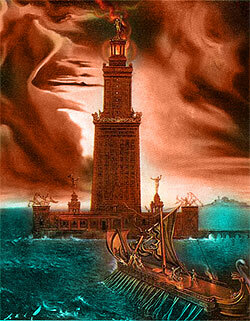 Ptolemy started building the lighthouse in 290 B.C. It was completed 20 years later and was the first lighthouse of the world. It was also the tallest building with the exception of the Great Pyramid. In the 10th century A.D., the lighthouse stood about 300 cubits high. That means that the lighthouse stood between 450 to 600 feet. The lighthouse was designed by a man named Sostrates of Knidos. The design of the lighthouse was not similar to the modern slim lighthouse towers. It had three basic structural elements. A rectangular base, an octagonal midsection, and a cylindrical upper section which housed the beacon. It was built in 3 stages, each built on top of the lower. The lowest level was about 200 feet square and had the shape of a huge box. The lighthouse was built on marble blocks. A staircase within the lighthouse led the keepers to the beacon chamber, containing a curved mirror used to project a fire's light into a beam. Ships could detect the beam from the tower at night or the smoke from it could be seen during the day from up to 100 miles away. For centuries, the Lighthouse of Alexandria (occasionally referred to as the Pharos Lighthouse) marked the harbor, using fire at night and reflecting sun rays during the day. It was even shown on Roman coins, just as famous monuments are depicted on currency today. When the Arabs conquered Egypt, they admired Alexandria and its wealth. The Lighthouse continues to be mentioned in their writings and travelers accounts. An earthquake shook Alexandria in AD 956 but caused little damage to the Lighthouse. It was later in 1303 and in 1323 that two stronger earthquakes considerably damaged the structure. The final blow was dealt by the Egyptian Mamelouk Sultan in AD 1480 when he decided to fortify Alexandria's defense. He built a medieval fort on the same spot where the Lighthouse once stood, using the fallen stone and marble. Sostrates of Knidos, who designed the lighthouse, wanted to have his name carved on the structure. But Ptollemy II wanted his own name carved instead. Sostrates, being a clever man, first carved his name underneath, concealed it with plaster and then carved Ptolemy II's name. After some time the plaster worn out and his name was revealed. On the virtue of being solidly constructed, the lighthouse survived the assaults of fierce sea storms and many earthquakes for some 1600 years. Although the Lighthouse of Alexandria did not survive to the present day, it undoubtedly leave an impact in many respects. The monument has been used as a model for many prototypes along the Mediterranean, as far away as Spain. And from a linguistic standpoint, it gave its name -- Pharos -- to all the lighthouses in the world ! !